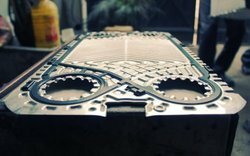 VRI has a stock of over 10000 NEW/REFURBISHED heat exchanger plates for most common models of ALFA LAVAL, GEA-ECOFLEX, APV, SONDEX, TRANTER, SWEP. Plates of different corrugation and thickness are available or arranged as per customer requirement. We provide offsite regasketing, servicing and testing of Plate Heat Exchangers. Looking for Plate Heat Exchanger Plate ?